Select from one of the packages below or call us for a custom package. We offer sailing adventures for several occasions including relaxing escapes, proposals, anniversaries, team building events, meetings, date nights, or family cruises. We specialize in bringing the best foods from Bainbridge farms paired with northwest wines to make your sails especially fun. 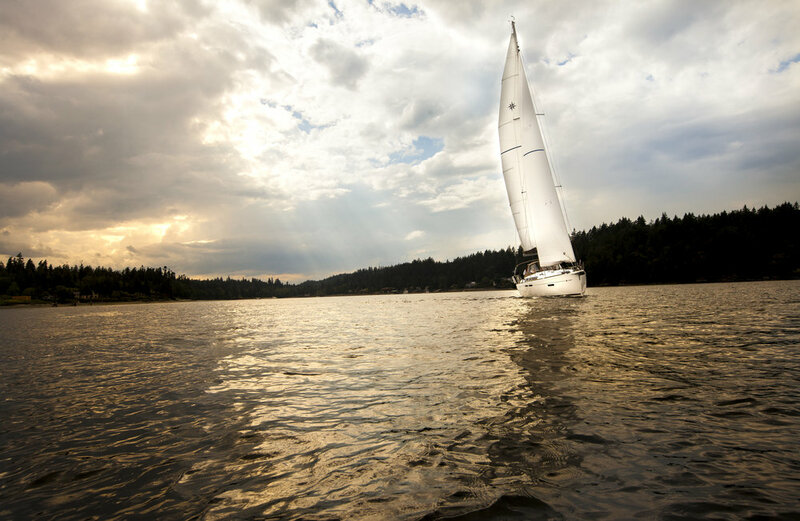 See the Puget Sound and then sail along the Seattle skyline by day or early evening. Seattle looks amazing from the view on your private yacht. Basic sail is $395 up to 6 guests. If you would like to add on our locally sourced wines or craft beer plus appetizers from our island farms price is $595 for day or $650 evening. All up to 6 guests. Our private chef evening cruise starts with a gorgeous sail along the Seattle skyline. We then start with our afternoon of French Champagne and appetizers including caviar. As you relax and sail you can listen to your pre-selected music or learn about this amazing area from your captain. We will sail into a private cove and there your private chef will prepare your meal that has been created based on your selections just for you! This sail price is $1495 for 2 guests. Additional guests are $100 per person. Our most romantic is our evening sail as the sun sets! We provide a complimentary serving of local wine or beer. We are able to add on a wine pairing with 6-7 local wines and custom appetizers or a full dinner from our chef if desired. If you are interested in adding this in we can discuss pricing when we talk. Plan on about 2 hours on the water. Day sail starts as our basic sail at $395 and evening sail is $465, up to 6 guests. Our sails start at $395 for 2 but we can accommodate up to 6 guests. You can add on wines and appetizers for your event, including French Champagne. Our chef's customized dinner, from appetizers through dessert is also available upon request. Call and we can design this day or night just for you! With our background in wine importing for many years, we will offer you a dazzling line-up of local and international wines hand picked for their quality. We then have these paired with specialty appetizers from our chef. Experience the best of this regions wines (including some from our own Bainbridge Island). This is a 2-3 hour sail. $695.00 up to 6 guests.